Auditions: Jan 23, at 12:00-2:00 PM by appointment (Register by clicking here, scroll to the bottom of the page and fill out and submit the audition registration form). Prepare a one-minute monologue. Call backs are later the same day. Casting students ages 13-17. The extraordinary spider Charlotte proves to be “a true friend and a good writer.” Determined to save the life of the pig Wilbur, she performs a miracle, spinning her web to read, “Some pig.” It’s the beginning of a victorious campaign. This is a beautiful, knowing play about friendship. Training and Rehearsals: Begin Feb. 6, and take place Tue & Thu 6:30-8:30 PM & Sundays 5:30-8:30 PM. Attendance is mandatory. The future belongs to a very different kind of person with a very different kind of mind. The era of “left brain” dominance and the Information Age that it engendered are giving way to a new world in which “right brain” thinkers — those who are nonlinear, intuitive and holistic — predominate. That’s the argument at the center of Daniel Pink’s book A Whole New Mind, in which Pink uses the two sides of the human brain as a metaphor for understanding the contours of our times. 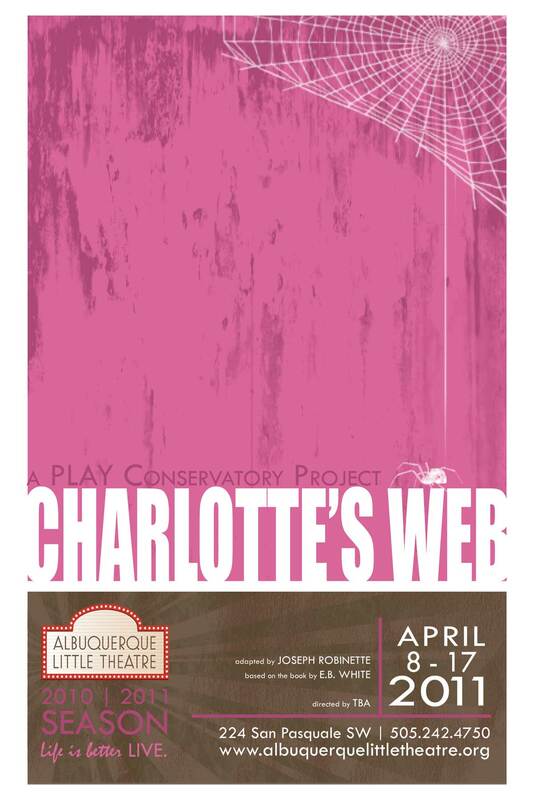 In a series of innovative workshops, Jonathan Dunski and Destany Bowersmith will explore with the students of the Charlotte’s Web project three essential aptitudes revealed in Pink’s book: Design, Story, and Empathy. These workshops intend to spur students to consider how such aptitudes apply to Theatre, and more importantly how artistic people will impact our world. This is a conservatory program. The tuition for performers is $355, which includes over 60 hours of learning, materials (script, pencils, etc. ), custom T-shirt, photo CD, four tickets to the preview on April 7, and six public performances of a professionally designed production. Payment is due on February 6. Make checks payable to “PLAY Conservatory”, or pay by credit card. Our mission is to make the PLAY Conservatory experience accessible to talented students, regardless of his/her financial resources. Limited scholarships are available. To apply, download and complete the scholarship form, and submit it along with your audition form.